The week-long media distortions in the reporting of the alleged nerve agent poisoning of Sergei Skriprol and his daughter is indicative of a democracy in crisis. When, in the days following the tragedy, Theresa May referred in glowing terms to British democratic values, embodied in a “free press” controlled by foreign billionaire tax evaders, many observers must have been left shaking their heads with incredulity at the sheer arrogance of the woman. Eager to politically exploit the unfolding of events in Salisbury to maximum affect, the prime minister undertook a staged PR walkabout in the city where, in a failed attempt to shed her robotic persona, she was photographed being handed a bouquet of flowers, cradling a baby and fist-bumping a young person. In what was a typically knee-jerk reaction to the alleged poisoning, May gave Russia 24 hours to respond to the allegations that Putin ordered the attack. What many people are apparently unaware of (due to the fact that journalists have largely failed in their duty to report it), is that under the terms of the Chemical Weapons Convention (CWC), Russia is allowed 10 days to respond. When Russia formally requested that the UK submit a sample of its evidence to the Organisation for the Prevention of Chemical Weapons (OPCW) for inspection, May refused the request. On March 14, the UK government also blocked a Russia-drafted UN Security Council statement calling for an urgent inquiry into the alleged incident. By refusing to rush to judgement, the leader of the official opposition, Jeremy Corbyn, took a far more rational, diplomatic and conciliatory approach culminating in his insistence that the government abide by its obligations under international law. In view of the fact that the City of London is awash with dirty Russian money, Shadow Chancellor, John McDonnell proposed the introduction of an oligarch levy and other measures to tackle corruption which the Tories rejected, presumably on the grounds that it would mean the Foreign Secretary, Boris Johnson, handing back the £160,000 he admitted to receiving live on television by way of a Russian donation. The government and their corporate media stenographers reacted to Labour’s rational stance by condemning Corbyn as if they were singing from the same hymn sheet. 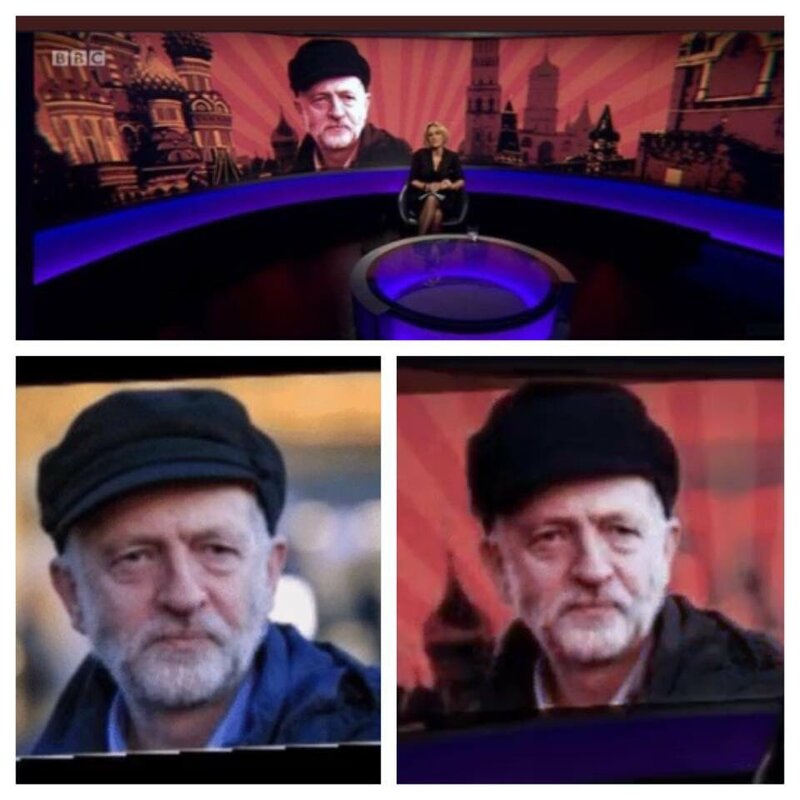 Thus, in the days following the media’s portrayal of the Labour leader as a ‘traitor’ and a ‘Kremlin stooge’ on their front pages, BBCs Newsnight presented a photoshopped image of Corbyn in sinister red set against a Red Square backdrop. This is how they depict the leader of the opposition who is asking for proper process and the rule of law over the Salisbury incident. The BBC have since denied that they photoshopped Mr Corbyn’s hat so to “make him look more Russian”. The denial has been roundly mocked on social media. It is quite clear that ever since the BBC propaganda piece, Saving Syria’s Children, the media have been attempting to soften the British public up for yet another full-scale UK intervention in the Middle East. It’s been 15 years since the U.S and U.K began raining bombs down on the people of Iraq and 7 since Libya was set on fire. In 1998, the UNs chief weapons inspector, Scott Ritter, announced that the policy to contain Saddam had worked and that Iraq had been effectively disarmed and hence was no longer seen as a threat. 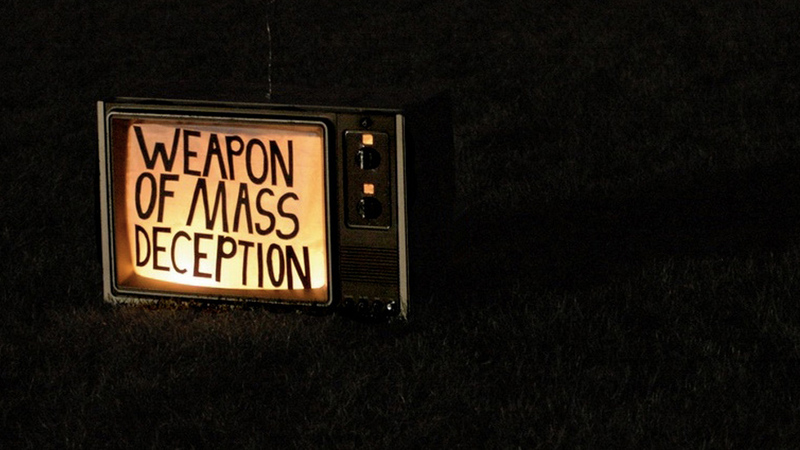 However, the attacks on the Twin Towers changed all that, exposing the lies to Washington’s own propaganda. With the notable exception of John Pilger in the Mirror, this series of events wasn’t acknowledged anywhere in the mainstream at the time and to this day remains a footnote in history. By contrast, the small minority of journalists who reported the narrative accurately were widely depicted as ‘conspiracy theorists’. Then as now, those who dissent from the political-media establishment narrative view of the world are smeared with similar epithets. Many corporate journalists who claimed to have learned hard lessons from the WMD debacle in Iraq are the same journalists who are currently regurgitating the UK government propaganda line in relation to the alleged Russian poisoning even before a speck of evidential dust has settled. Further, journalists in almost total lock-step have once again failed to express any skepticism in terms of acknowledging that the Western imperialist proxy war in Syria represents the same regime change continuum that involves the theft and control of the regions natural resources. There have been some notable dissenting voices. Rather surprisingly, for example, Channel 4 News journalist, Alex Thomson, has cast a robust critical eye over the events in Salisbury, while Mail on Sunday columnist, Peter Hitchens expressed shock at the treatment meted out to Corbyn. On cue, these actions look set to take military form with strikes against Russian forces in the Syrian capital, Damascus seemingly planned for the near future. Further, on March 19, RT cited a resident of Eastern Ghouta, warned of possible preparations for a “provocation” with the use of chemical agents. According to the RT article, Russia believes that such an attack will be widely covered in the Western media and may ultimately be used as a pretext by the US-led coalition to launch strikes against Syrian government forces. These are extremely dark and worrying times. 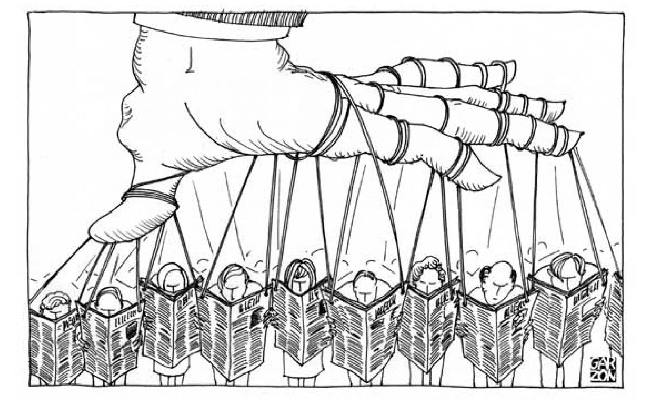 The conformism of the mass media and the shouting down of all voices who dissent from the prevailing orthodoxy, is not illustrative of the kind of democracy I have grown up with, but reflects something far more sinister. Neoliberal v Neoclassical economics – what’s the difference? Superb piece Daniel Margrain! love your writings and the journalism Renegade Inc is producing. I to agree Peter Hitchens has been a very fine exception in debunking the propaganda blitz on Syria, anything Russia, and the gross media attacks on Corbyn by his colleagues and peers. Great piece, keep up the good work! Mary Dejevsky (unfortunately disliked by Craig Murray) has also presented two skeptical articles. Although a generally crap new source, The Independent has three excellent foreign correspondents in Fisk, Cockburn, and Dejevsky. It is noticeable that The Guardian, which also prints Dejevsky, has not presented her skeptical views. Only Richard Nkrton-Taylor has presented anything approaching skeptiscism, but well hidden and rather mildly. Thanks Renegade for being here now in these perilous times; and pointing out the reality behind the propaganda. Excellent piece by Daniel Margrain, thank you too Daniel. And the treatment of Corbyn was utterly disgusting. Great article. I could be more forgiving of people buying into this latest piece of Russia drama had we not as you stated been here now so many countless times before with the exact same techniques, exact same “expert” opinion, exact same method of generating a consensus that operates in lieu of evidence. It is the ultimate failing of our education system that so many people are incapable of thinking for themselves and fall for the same spin time and time and time again.